National expert Amanda Roberson from Maryland will be presenting "How to Creating Active Learning Centers in Libraries on a Budget." Are you thinking of incorporating play spaces into your library, designing a new library space or something in between? If you are looking for a good place to start, some research to support play and steps to take to make it all happen, you might be having a hard time. When I first started working to incorporate play in libraries 5 years ago there were little to no resources on how play might look in a library or how to get started. Since then there have been many ground breaking libraries who have presented conference sessions, written blog posts and posted information on webpages. Then the second edition of Every Child Ready to Read, released in 2011 included a great module on Learning Spaces in Libraries. Over the years, information has become easier to find as research on the value of play has become an important message in early literacy. Best practices, ideas for types of play and practical steps for incorporating play in libraries are harder to find. 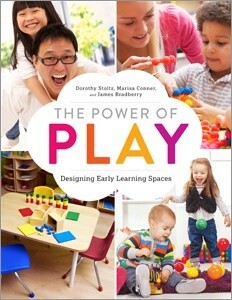 “The Power of Play: Designing Early Learning Spaces” by Dorothy Stoltz, Maria Conner and James Bradberry is a great resource no matter how big or small your learning space project. This practical guide provides research in support of play, steps to creating play spaces, planning guides, examples of play spaces and management tips. The information in this book is applicable to any size library or play space project and highlights how these spaces are supported by research and early literacy goals. It is to read from cover to cover or to use as a step by step guide. I wish I had something like this when I was getting started! Please join us on August 19!